The humble kitchen spatula, not to be confused with a lifter and slicer, is designed for cooking meals that require flipping such as steaks, burgers and fish. These all-purpose spatulas can be used in hot pans and resistant the high temperatures that pans generate whilst cooking. They can be used to scrape, move and flip food within the pan, ensuring burning does not occur on any side of your food. As they are extremely resistant to high temperatures, these high quality kitchen spatulas are stain resistant and dishwasher friendly making them ideal for the hot and busy commercial kitchen. Kitchen spatulas are just one of the many chefs tools a professional needs. Luckily at Pattersons Catering Supplies we stock a comprehensive range of kitchen utensils for cooking, serving and more. Browse our complete range of catering products here online, order today and we will deliver next day UK wide. 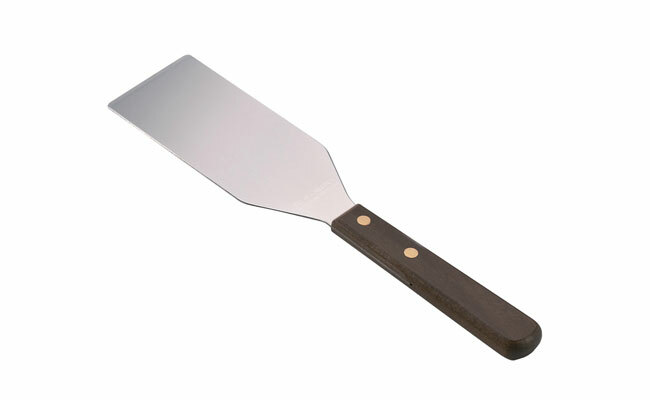 High Heat Scraper Spatula 16.5"
Spoon Shaped Rubber Spatula 13.4"